This 720p high definition wireless IP camera provides a complete, cost-effective network video surveillance solution, ideal for monitoring homes, small offices and retail businesses. Quick and easy setup with Zmodo latest connection technology. View video remotely using your smartphone, iPad, or PC. No configuration necessary, just run the setup and the camera will communicate with your smartphone automatically. Receive smartphone notifications when unexpected motion is detected. You can also schedule alerts by specific times and dates. The automatic infrared lights make sure you can see clearly up to 65ft in the dark. You can expand and customize quickly and easily with extra cameras, providing a whole solution for your home and business. Note: please connect your phone to the 2.4Ghz network if your router provides both 2.4Ghz and 5Ghz network. 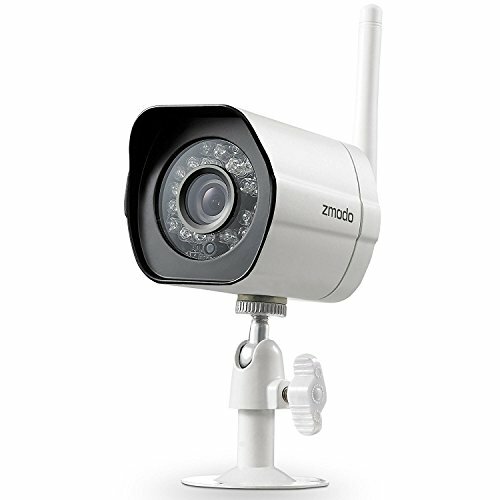 Weatherproof Camera Housing-You can install the cameras indoors and outdoors to cover your home in all aspects.Connectivity:IP/Network-2.4 GHz Wireless (Not compatible with 5 GHz). 720p HD-you can see crystal clear and detailed images with this high resolution camera.IR Night Vision-See what's happening in the dark with automatic infrared lights. Up to 65ft night vision. Easy and Quick Setup-Turn on the camera and complete the network configuration in just minutes.Receive intelligent smartphone motion alerts when motion detected. If the lights are solid blue, please type + , choose Wireless Device instead of Zink to find the cameras.No monthly subscription fees and lifetime US tech support. (Android 4.0 and newer and iOS 7 and newer) mobile devices app and web view available. Zmodo Cloud Service - 24/7 continuous recording on cloud, and you can customize, share or download footage at any time. Motion clip alerts are saved on cloud for 36 hours for free. All users are also eligible for a 30-day free trial. Zmodo cloud also boosts your device's intelligence level, such as reducing false alerts. 3 Year Manufacturer Warranty, including 60-day return for refund Warranty. Lifetime US-based Support.